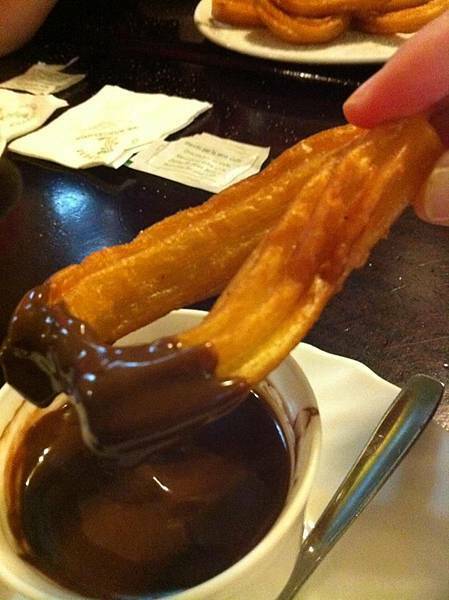 The best dessert I had when we went to Barcelona this summer was the famous Spanish Chocolate con Churros. I had it twice in three day!! It was that delicious, honestly! I've been missing it so much ever since I came back to Los Angeles, and have been looking up recipes trying to duplicate the taste, but have not been able to achieve my goal until this morning. Not 100% yet, but close enough!! 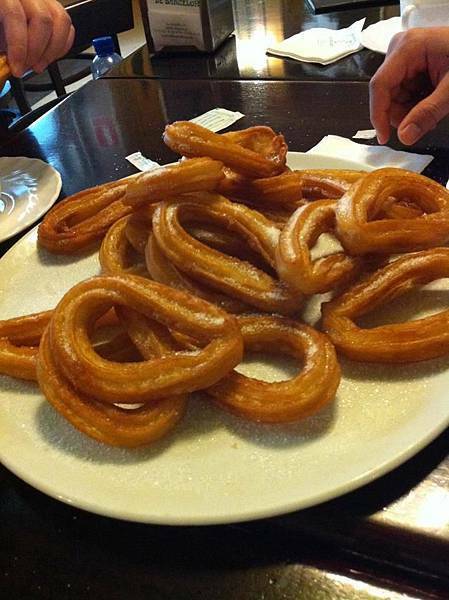 Most of the churros recipes call for eggs to be added to the dough, but it tastes more like fried cream puff shells with center way too tender and eggy rather than the churros from Barcelona which was cripsy on the outside and much firmer and chewier in the center. As for the Spanish hot chocolate, most recipes deliver a really rich chocolaty thin drink not at all the thick pudding like chocolate I had in Barcelona. 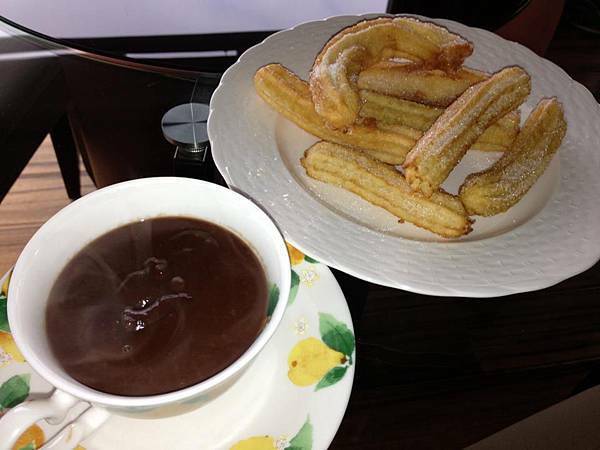 Here are the recipes of the Spanish hot chocolate and the chewy churros really taste like the ones I had, and I'm really happy with the result!! 1. Blend together corn starch and cooca powder, and mix it well in the cold milk in a small sauce pan. 2. Cook the chocolate milk mixture over medium heat. Stir constantly to avoid burning. Cook until think and starts to boil. 3. Remove from heat, and add the chocolate chips. Stir to disolve the chips. Pour into 4 cups. 4. 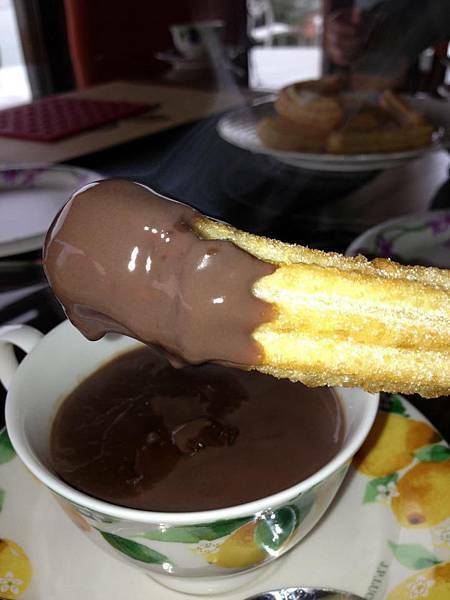 Serve the chocolate hot with the churros. 1. In medium sauce pan, bring the water to a boil. Dissolve salt in it. Add oil. 2. In another sauce pan, heat up enough oil (about 2") for frying the churros over medium heat. 3. Add the flour to the water, mix well, and continue to cook over medium heat until the dough is smooth, and forms a ball. Stir or beat with a spatula or wooden sppon constantly while cooking. 4. Remove the pan from heat, and continue to mix until it cools down to a touchable temperature. 5. Use a star tip, and pipe the dough into 5" long sticks, or the teardrop shapes, or even donut circles on a tray or plate. Makes about 12-16 churros. 7. Sprinkle them with granulated sugar, and serve with the Spanish hot chocolate. * Make the churros first, and then make the chocolate since it is much faster making the chocolate than making the churros. ** Be patient frying the churros. Mine in the photos were too pale. ENJOY!!! They are so delicious!!! 上一篇： Long Time No See!